Cloud adoption is on the rise. However, many companies are taking a cautious approach to deployment due to the relative newness of the technology. For most companies, cloud offers many benefits including moreefficient use of IT resources, reduced operating costs, increased agility to meet changing business needs, and a platform for IT to transition to a more service-oriented approach. Unfortunately, several challenges can prevent a company from achieving these benefits. To address these issues, companies are looking for solutions that allow them to mix and match cloud offerings from different vendors and providers. 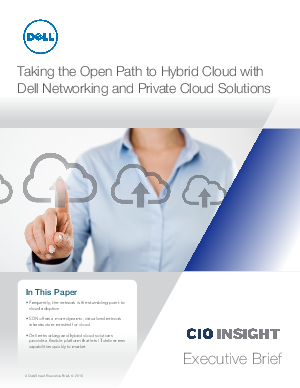 Download this white paper to learn more about hybrid cloud with Dell® networking and private cloud solutions.